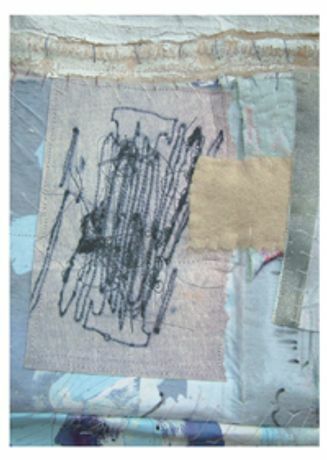 Clare produces large-scale abstract textile constructions, made up from many sources: digital photography, embroidery, screen print, painted and textured surfaces. She begins by constructing 3d objects from low-tech materials such as paper, plastic, wire and scrap fabric, and using processes like folding, tying, knotting and wrapping. These 3d sketches are photographed using strong light and filters such as painted glass and translucent papers. 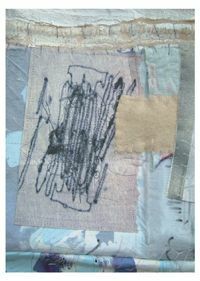 These are digitally printed onto recycled papers and woollen fabrics and worked over with screen print, paint and stitch, finally patch-worked together to produce textile hangings. Clare has been commissioned to make work for public and private spaces and has a piece in the Emirates Towers, Dubai, made in 2004. Clare studied at Central St. Martins and was selected for the current Arts Council Setting Up Scheme, South East, where she has a Digital Artist Placement with Waddesdon Church of England School, Buckinghamshire.